The Farwell Community Association is composed of 3 block clubs that grow chemically free fruits and vegetables for our ccommity. Play in the garden on May 7th! This will be our 6th year!!! We are so excited to again share this wonderful garden with the city. This garden sits on one of Detoit' s recreation park sites. For the past two years we have been blessed to take part in the Motown Mission volunteers who volunteer throughout the country helping communities. We will continue to fundraise, by contacting businesses and community to help volunteer and donate to the garden. We will also leaflet the community, attend and present at community meetings around our district. Our community will post on social media and our community and business contacts. We are contacting various organizations, schools, churches and businesses in the city and asking for volunteers to assist us in this endeavor. Once we have the funds in hand we will continue to repair the gazebo, feed the volunteers, plant and ask volunteers to assist in the upkeep of the garden. Since we do not have access to water we will run soaker hoses undergrown that will be attached to our rain barrels where we collect rain water. Currently the gazebo roof is leaking and we would like to repair the roof and run gutters to the rain barrels to collect the rain water. There are quite a few schools in our area and we will contact the schools to invite students to come and paint the rain barrels, signage and makers for the garden. In this area there are seniors who can not afford to move, young people who will need guidance in what it means to be a good neighbor, advocate for the environment and encouraging people to want to live in a safe environment where we all can live. Our community does not have adequate resources for fresh vegetables. There are grocery stores but they are not in the immediate area. This is also a way to bridge relationships from one city to another. Our garden has brought communities and cities together by working in the garden. Keep Detroit Growing is a wonderful example of working together to grow fresh produce in our area. We have dedicated a portion of the garden to our young people to clean, plant and harvest their produce. The children will be trained on how to plant and harvest their produce and sell the produce at our local Eastern Market. We will continue to encourage students to become actively involved by haveing them paint the rain barrels and murals around the garden. 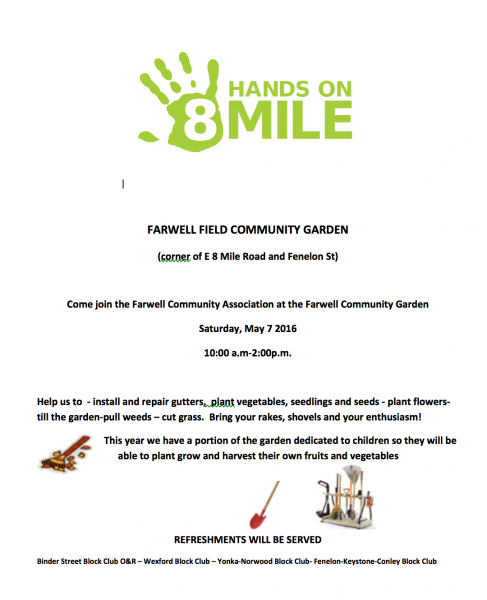 Join us on May 7th from 10 am - 2 pm at the Farwell Community Garden (corner of E 8 Mile Road and Fenelon St.). Help us kick off the summertime gardening activities and enjoy playing in the dirt. We'll provide snacks. No rsvp needed just come on over. 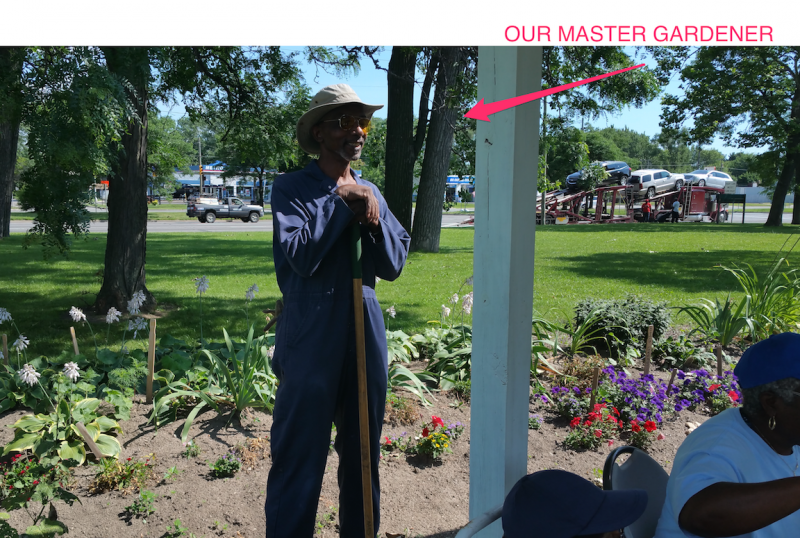 You'll even get to meet our Master Gardener, Cle Williams! Will help us purchase a shovel, rake, garden hoe. Will help us advertise by purchasing paper,toner, postage or envelopes. Will also help buy mulch, top soil, wood chips or compose and various plants, paint and gloves. Helps the purchase of soaker hoses, under grown piping poles and boards for signage. Your donation goes towards the rental of a Porta Potty and Refreshments (bottled water, fruit, juice, etc) for volunteers.